Using the BeautyLab London skincare range which is rich in natural active and high performance peptides. BeautyLab combines the latest skincare science with the purest paraben-free ingredients to offer a targeted solution for every skincare concern. Alongside BeautyLab we also use Katherine Daniels cosmetics for our facial and body treatments. Katherine Daniels is a results driven facial and body-care range utilising plant, marine, collagen and biotech active ingredients. Lightfusion phototherapy treatment uses LED red and near infra red lightwaves to help the skin function better, detoxifying from the inside out, increasing collagen and elastin production. Results are seen from the first treatment. A course of 4 weekly treatments is recommended to soften fine lines and wrinkles, reduce pigmentation and redness, improve skin tone, texture and refine the pores whilst firming, smoothing and brightening the skin. Combining lightfusion with BeautyLab essential skincare products. a facial for the hands. The ultimate in skincare luxury! Lightfusion can also be added to a manicure helping to smooth, plump and refine the skin and reduce age spots on the back of the hands. £10 on top of regular manicure price. Adapted to all skin types, this facial combines all the essentials for healthy, soft and radiant skin. Skin is left cleansed, polished and beautifully conditioned. An intensive treatment that leaves the skin lifted, radiant and reducing the appearance of fine lines. Also addresses the ageing concerns of the neck, décolletage and incorporates the hands. A treatment for fragile and sensitive skin issues. Your skin will be calmed, soothed, strengthened and more able to defend itself against premature ageing. Ultimate relaxing facial using heated stones to massage face and neck. Microdermabrasion is a non-surgical procedure offering safe and controlled skin abrasion. The diamond tipped wand glides over the skin with a vacuum action gently polishing the skin. The treatment is more gentle than traditional methods as a selection of diamond wands are used to create a bespoke treatment for each client. A course of 5 treatments is recommended. Ideal for dull and lifeless skin showing signs of dehydration. 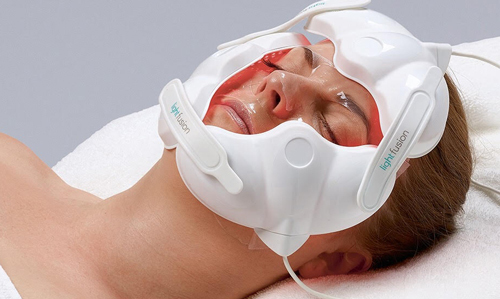 Using microdermabrasion to intensify the absorption of the products into the skin. Your skin will be bright, radiant, plumped and open pores refined and fine lines reduced. A unique resurfacing treatment combining glycolic acid and pomegranate enzymes to relieve congestion, age spots, scarring, pigmentation and dullness. Suitable for all skin types, this treatment will smooth and brighten your skin after just one treatment, however a six week course is recommended for lasting results.